If Game 6 of the American League Championship Series wasn’t the most interesting and exciting game this month, it’s certainly on the short list. If the Royals had lost, we’d all be talking about Ned Yost’s questionable bullpen maneuverings. Not to mention Jose Bautista’s two huge home runs. In Toronto, they will be talking about that highly questionable called strike to Ben Revere for a long time. Or at least all winter. 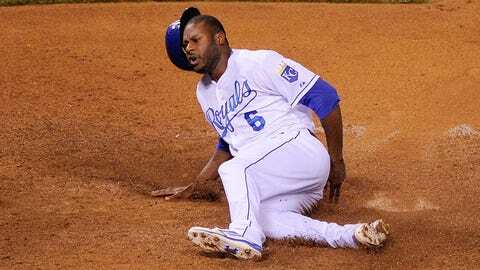 But our last pre-World Series October Moment has to be Lorenzo Cain scoring from first base on … a single? Yeah. A single. In the bottom of the eighth inning. With nobody out. Just in case you missed it, Bautista tied the game with a two-run homer in the top of the eighth inning. Shortly afterward, Wade Davis entered the game and put out a small brush fire, but the damage had been done. About 45 minutes later, the tarp was off the field and they were playing again. With Jays closer Roberto Osuna in the game, Lorenzo Cain led off and drew a walk, after fouling off a 3-2 pitch. Which brought up Eric Hosmer, and he also fought off a two-strike pitch. But Hosmer fought his two-strike pitch into the right-field corner, with Bautista giving chase. Which meant the Royals were in tremendous position to take the lead, what with Hosmer on first and Cain on third and still nobody out. Which is why I don’t really understand are the suggestions that Bautista should have thrown toward first base rather than second. Throwing toward first base would essentially have been conceding the double, and Bautista’s just not programmed to do that, there. What’s more, while it’s true that Cain would have stopped at third if Bautista hadn’t thrown to second, he still probably would have scored eventually. After all, Osuna’s a fine pitcher but the Royals are a bunch of contact hitters, and they get runners home from third base when nobody’s out; there was something like a 75-percent chance that Cain was going to score, one way or another. And the Royals’ chance of ultimately winning was even higher than that. So Cain’s play isn’t our October Moment because it decided the game; maybe it did, but maybe it didn’t. It’s our October Moment because it’s a call-out. It calls out how the Royals just keep scoring enough runs with timely hitting and derring-do on the bases. And it calls out the good judgment of third-base coach Mike Jirschele, who took some unfair criticism for not waving home Alex Gordon a year ago, and now should get enough acclaim to make up for that. Next up: The World Series, and we’ve three whole days to think of new questions to ask about Yost’s managing.